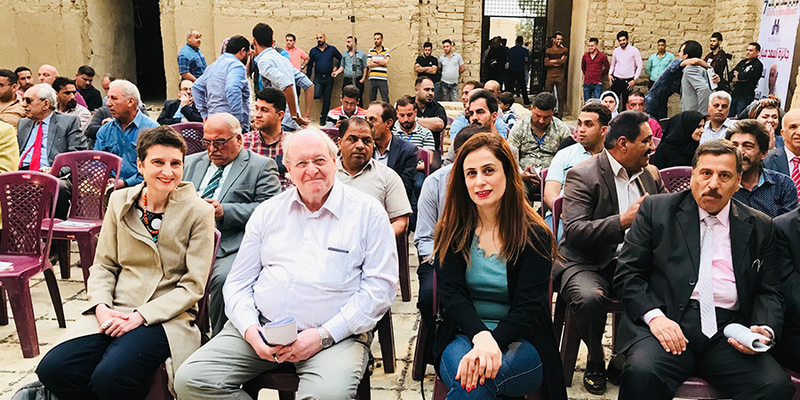 Poet, novelist, and University of Chichester lecturer Dr Naomi Foyle experienced a vibrant taste of Iraqi hospitality when she read to an audience of 2,000 poetry lovers at the Babylon Festival for International Cultures and Arts. The week-long festival is held in Babil, Iraq, the ancient ruins of Babylon, near the modern city of Hillah, 100 km south of Baghdad. The festival, established by dictator Saddam Hussein, was originally a propagandist event intended to glorify the dictator’s might and was discontinued after his fall. Initiated in 2012 by national figure Dr Ali Al-Shalah, the new festival celebrates Iraq’s ancient role as the cradle of civilisation, its enduring cultural and intellectual wealth, and its hopes for a peaceful, inclusive future. Events this year included a fashion show based on the cultures of ancient Sumer and Babylon, readings by poets and writers from Europe, Syria, Egypt, Iran, and Iraq, concerts on traditional instruments, a comedy act, films shown in a cinema in Hillah, and a talk on Babylonian history. Dr Foyle had the honour of helping to launch the festival, at the opening night, in the amphitheatre. She also read her work at a later poetry event held in an ancient NIN MAH Mother Goddess temple, with translations provided by festival translator Ammar Al-Shalah, and Cairo-based Raphael Cohen and Ahmed Taha, who worked on A Blade of Grass: New Palestinian Poetry, a book which Naomi edited last year with the help of a University of Chichester Research Development Award. 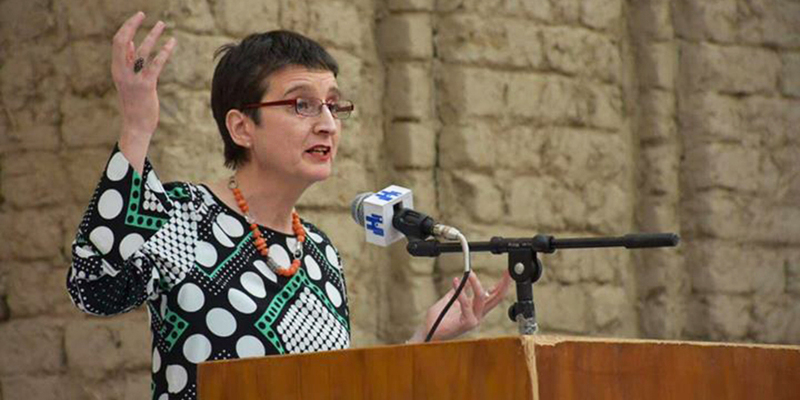 She said: “Being deeply involved in Arabic poetry, basing my science fiction series in a parallel Mesopotamia, and having learned much about Iraq from my Chichester colleague Visiting Fellow Waleed Al-Bazoon, I was thrilled to attend the Babylon Festival. The Festival Foundation aims to persuade UNESCO to grant Babylon the World Heritage Status that has not yet been possible because of damage sustained to the site. Naomi Foyle's next trip to the Arabic speaking world is planned for late July, when she will visit Palestine for the Jerusalem and Ramallah launches of A Blade of Grass. She will be travelling with Rachel Searle, director of Blake Fest (Bognor Regis), with whom she is planning a Jerusalem-themed event for this year's festival. The launches will feature locally-based poets Marwan Makhoul and Maya Abu Alhayyat and Jerusalemite-Londoner Mustafa Abu Sneineh. Dr Foyle is currently running a crowdfunding campaign to raise money to also bring New York City-based anthology contributor Farid Bitar over to read at the launches, a poet returning to his homeland for the first time in over a decade. To find out more on A Blade of Grass: New Palestinian Poetry visit http://smokestack-books.co.uk/book.php?book=145. Alternatively for more about Dr Naomi Foyle and her research at the University of Chichester go to www.chi.ac.uk/staff/dr-naomi-foyle or www.naomifoyle.com.